Ruth Bader Ginsburg asks the most important question of oral arguments in Whole Woman’s Health v. Hellerstedt. 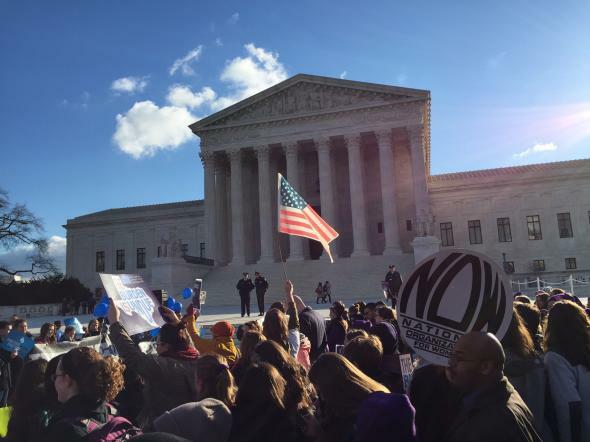 A pro-choice rally outside the Supreme Court on Wednesday, urging the justices to invalidate Texas’ stringent new abortion law. Wednesday’s oral arguments in Whole Woman’s Health v. Hellerstedt, probably the most important Supreme Court abortion case since 1992, centered around one key question: Does a Texas law that forces abortion clinics to meet stringent new standards—in the name of shielding “women’s health”—impose an “undue burden” on a woman’s right to terminate her pregnancy? In other words, would the law make it difficult, or maybe even impossible, for many Texas women to exercise their right to abortion? And if so, can the state wave away this issue by insisting, without much evidence, that such draconian regulations are still necessary to protect women? Seconds after Texas Solicitor General Scott Keller began to speak Wednesday morning, Justice Ruth Bader Ginsburg zeroed in on the “undue burden” question—quickly and mercilessly knocking Keller off balance and setting the tone for the rest of his nearly 40 minutes at the lectern. Ginsburg asked Keller how many women would live 100 miles or more from a clinic if the Texas law went into effect. About 25 percent, he responded—but that didn’t include the clinic in Santa Teresa, New Mexico, just over the border from El Paso. The existence of this clinic featured heavily in the 5th Circuit’s decision to uphold the Texas statute; it asserted that the law did not impose on “undue burden” on abortion-seeking El Paso women, because they could simply cross state lines for the procedure. “That’s odd that you point to the New Mexico facility,” Ginsburg said, in a clear and firm voice. New Mexico, after all, doesn’t force abortion clinics to meet the same standards that Texas would—standards which, Texas claims, are absolutely critical to protect women. This exchange was Keller’s first of the morning, and Ginsburg delivered a knockout punch. She very efficiently revealed the inconsistency at the heart of Texas’ argument. The state vows that its new standards—which include minimum sizes for hallways, doorways, and ventilation systems—are essential to protecting women’s health. But when confronted with the fact that these standards are so onerous and expensive that they will shutter many clinics, Texas shrugs and suggests women drive to another state without those ostensibly crucial standards. And in an impressive display of chutzpah, the state even relies on the continued existence of New Mexico’s clinics to defend the constitutionality of its own law. Over the following excruciating 40 minutes, the liberals took turns brutally hammering Keller about the true justification and motivation for Texas’ law. (Why single out abortion when other procedures, like colonoscopies, pose an exponentially higher safety risk? Is there any proof that clinics were unsafe before the enactment of the new rules?) But Ginsburg’s early colloquy stuck out as the moment when Keller lost control of his narrative. The extraordinarily skilled advocate approached the lectern with Texas swagger, loudly exaggerating his drawl and smugly dismissing concerns that the law in question might disadvantage women. By the time he limped away, his voice was quiet, his tone was melancholy, and his Texas accent had all but disappeared. The Texas law may yet survive. But Ginsburg’s questioning amply demonstrated that it is, beneath the post hoc rationalizations, constitutionally indefensible. *Correction, March 2, 2016: This post’s photo caption initially misstated that the rally against the abortion law took place on Tuesday. It occurred on Wednesday.